I love creativity and fun – especially when it involves bicycles. From #30daysofbiking to #cyclingcaptuesday, I have always enjoyed the fun of bicycle games, the conversations they start, and the enthusiasm they kindle. And when the bicycle games get more people, new people, out riding their bikes more of the time, it’s even better. My Flickr/blogger/Twitter friend and radonneur extraordinaire, Mary G, who has an excellent cycling blog, Chasing Mailboxes, cooked up a grand idea for some winter cycling fun. She is calling it the Utilitaire 12, and you can read all about it here and here. My own heads-up for this project first came from another great cycling blogger/friend, the “Old Guy” (and don’t let that moniker fool you – this guy can out-ride most 20-somethings) – and he’s already a few steps ahead of some of us on the Utilitaire challenge. Of course. I won’t try to repeat all of the guidelines to the challenge which you can read for yourselves, but basically it involves making at least 12 destination trips by bike over the course of the next six weeks. There is a very do-able minimum mileage for each trip, and you can’t simply make the same trip over and over (like go to the grocery store 12 times). I think this is what I love about it most – it’s going to make me mix-up my destinations, maybe bike to a place or an event that I might not normally bike to, head to a variety of locations for different reasons. Go to a concert, attend a meeting, cycle to breakfast … and lots more (with a little wiggle room for a substitution if you need it). You can only officially log two trips per week, spreading the project out for some consistency, and you have to photo-document part of the journey. Cool beans, eh? Good for everyone, good for cycling advocacy – and I hope everyone will give it a go. 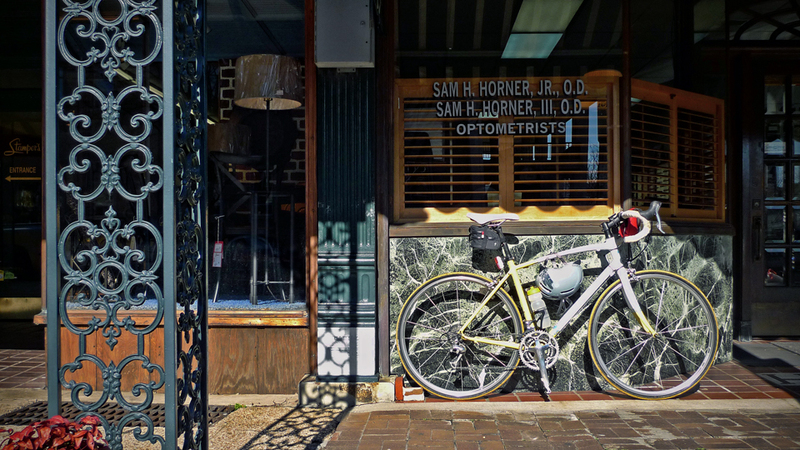 Today I got to log my first trip for my control card – a trip into town to the bike shop. Also stopped for coffee and to my optometrist to fetch some new contacts, but my project destination was the shop. 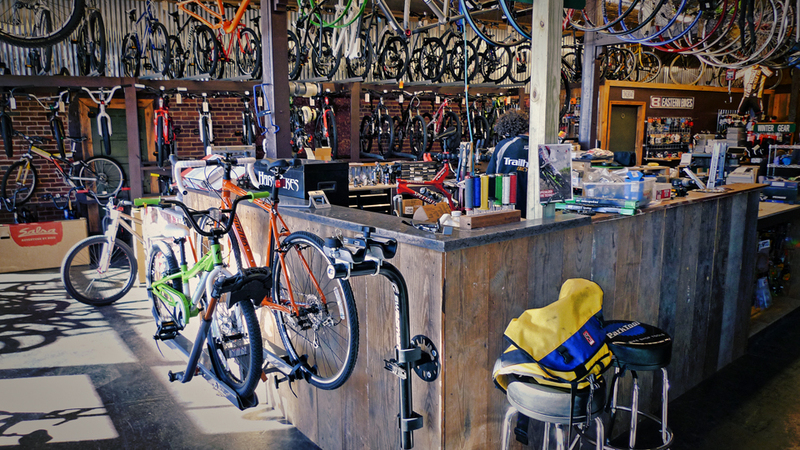 I love my bike shop – it’s kind of like a really great coffee shop, only with bikey stuff rather than caffeine. 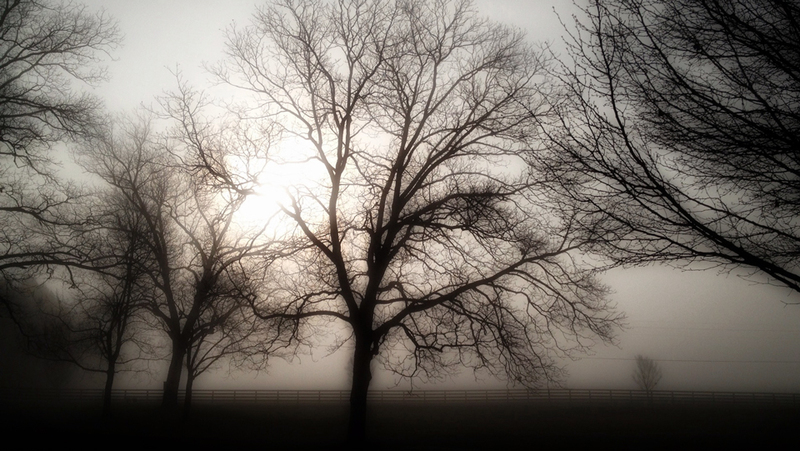 It’s got a certain “ambiance” – camaraderie, color, and conversation. And I had a great conversation with my bike shop guys, Charles and Andrew, had them looking over the Utilitaire project in the shop. 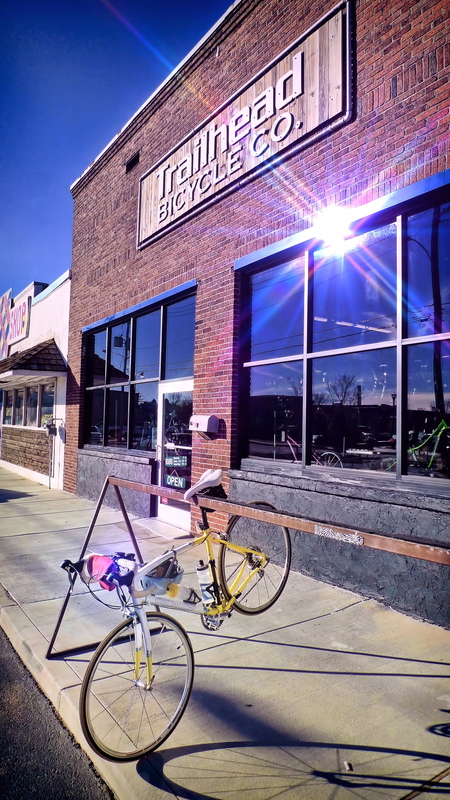 We enthusiastically decided that this would be a fantastic advocacy tool for local cycling in our little town, and it looks like plans are into work to make a modified community event sponsored by the shop. How great is that? !